Dine like a local. 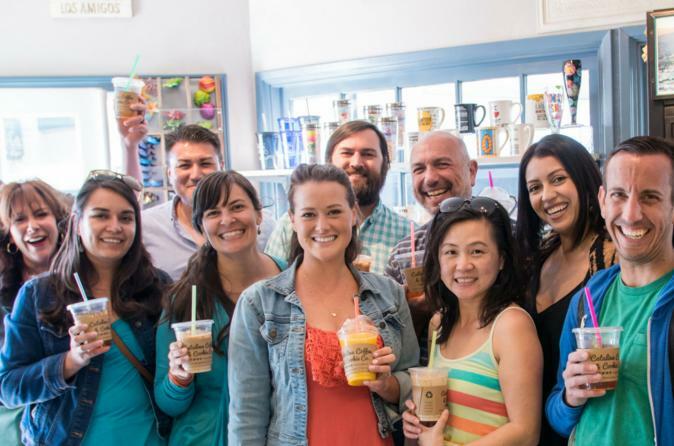 Experience Catalina's history, culture & foodie fun with our knowledgeable guides on this delicious 3-hour food tour. Enjoy an all-inclusive experience as you sip, sample & savor Avalon's best. Encounter the sights, sounds and stories behind our well-known historic landmarks. Relax by the ocean on Catalina Island's only food & beverage excursion. Experience six unique tasting locations - meet the people responsible for Avalon's food scene. Guidebook includes tour map, cultural insights & exclusive guest coupons! Tour is limited to 16 people to ensure a personalized experience. Make your way to the starting point and meet your enthusiastic guide and local food buff, who serves as your epicurean concierge for this small-group walking tour. Catalina Island is renowned for fresh seafood, delicious family recipes and expansive views of the Pacific Ocean. Be sure to come hungry for this culinary exploration to the island’s best restaurants. Follow your guide down scenic Front Street. See original Catalina tiles from the early 20th century on the way to your first tasting. You’ll walk about a mile and sit down at six locations in all, for a smorgasbord of good local food. Taste homespun favorites, sweets and fresh seafood pulled straight from the local waters. Discover Avalon’s quaint streets and friendly locals as you stroll this postcard-worthy seaside town. Admire the iconic waterfront architecture, including the world famous Casino Building and the Inn on Mt Ada. Your guide will share fascinating insights as you walk to your tastings. For the finale, enjoy a local favorite before continuing to explore lovely Catalina on your own.